Prepare to experience the rise of great civilizations, the competition for resources, the war against barbarians, and the pursuit of scientific knowledge? You’ll establish trade routes, build massive cities, and recruit armies to ensure that you’ll build a lasting empire. But don’t forget the favor of the gods, which you’ll need to rise to the top! 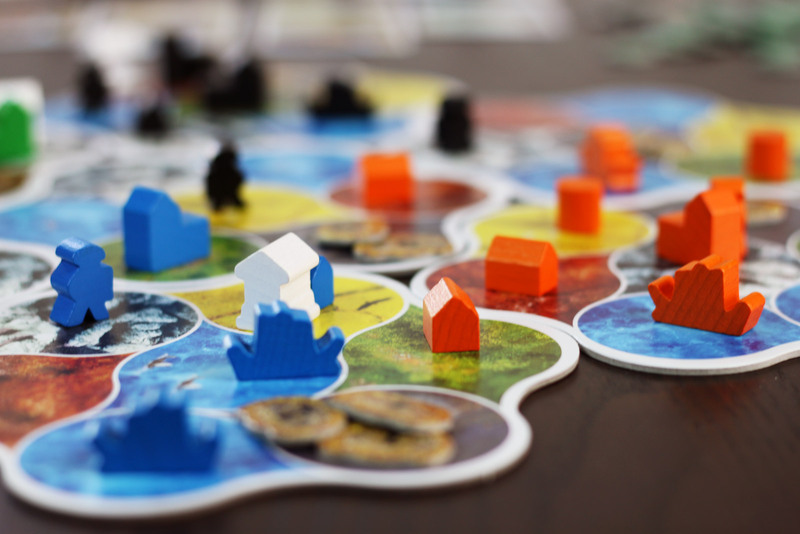 All this and more can be had in the board game Deus, designed by Sébastien Dujardin. The rules of Deus are deceptively simple. You’re building a kingdom or civilization or whatever you want to call it, spreading your control across the land in hopes that by the end of the game, you’ll be the most awesome ruler of all. Of course, you may need help from the gods along the way. Construct a Building or Make an Offering to the gods. If you Make an Offering, you simply discard any number of cards from your hand. Depending on the color of the top card, you get a benefit from one of the 6 gods – Neptune, Ceres, Minerva, Vesta, Mars, or Jupiter. The size of the benefit is based on the number of cards you discard. 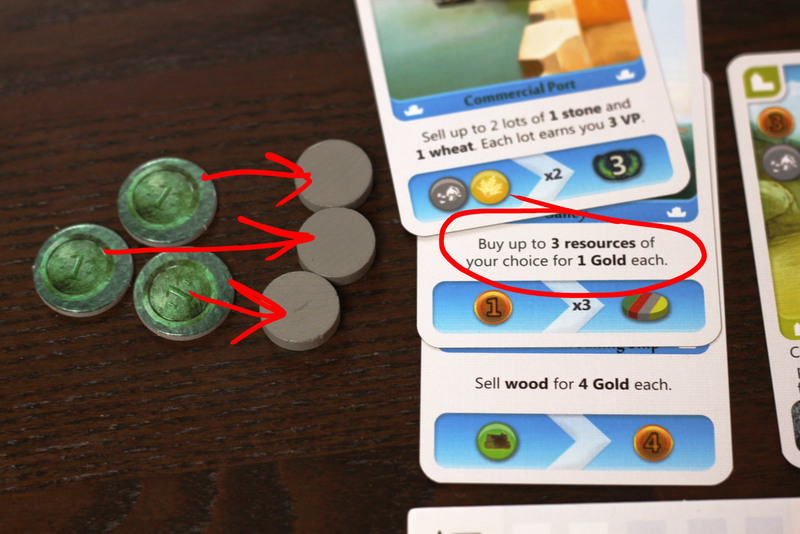 You can get resources, money, points, extra cards, or extra buildings added to your supply. Regardless, you always refill your hand to 5 cards and add 1 building to your supply. Constructing a Building is where the core of the game lies, though. 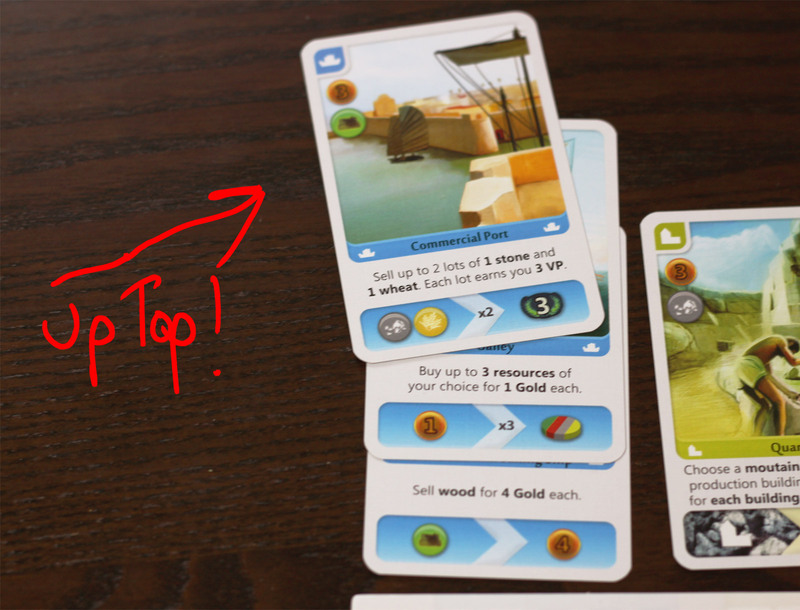 When you play a card, you pay the necessary resources, add a building of the appropriate type to a region you control, or an adjacent region, and then you add the card to the top of the column of cards of the same color by your player board. 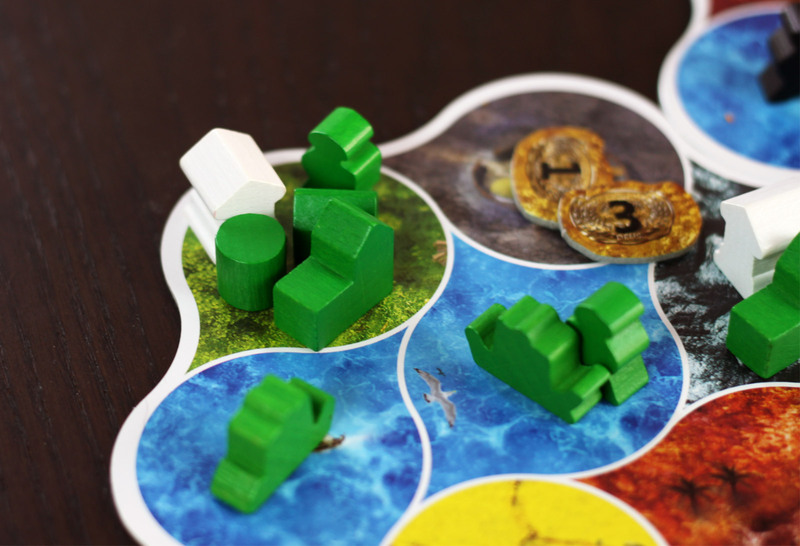 … then we can add a boat to the board adjacent to a region we control. Boats can only be built on water tiles. …we activate all our building cards from bottom to top. Starting at the bottom, we can convert some of our wood into cold hard cash. The next maritime building lets us buy resources but at a much cheaper rate than we sold them for! We’ll take some stone here. Finally, the building we just built – it lets us convert Wheat and Stone to points. Fortunately we just collected a bit of wheat and stone, didn’t we? So we’ll just trade that in and score big time. Nice. This is where the game gets interesting. 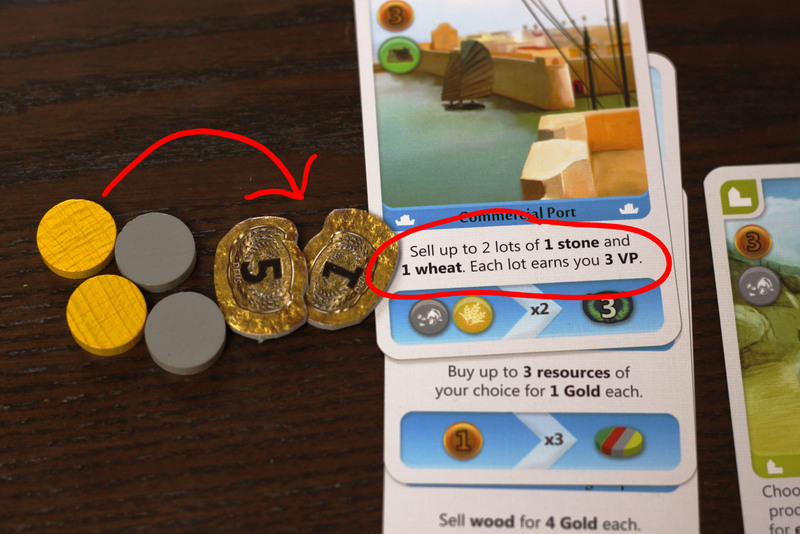 See, each building has a special ability – some produce resources, or convert resources to money or points, or let you draw extra cards – a wide variety of things. However, you can only activate a building when you build a new building of the same type. At that point, all of the buildings of that type are activated, from the bottom of the column to the top (in other words, the order you built them). This means that if you build 5 buildings of a single type, the first one you build gets activated 5 times while the last one only gets activated once. Of course, you can only build something if you have it in your supply, which means you’ll have to build a variety of buildings and you’ll be constantly under pressure to produce resources and cash as well as pulling more buildings into your supply. There are a few other rules here and there – you can destroy Barbarian Villages by surrounding them with buildings (and including at least 1 military) which awards some points. You can spread your civilization as far as possible, or you can crowd multiple buildings into a few spaces, the only limit being that you can’t have two buildings of the same type in one space. 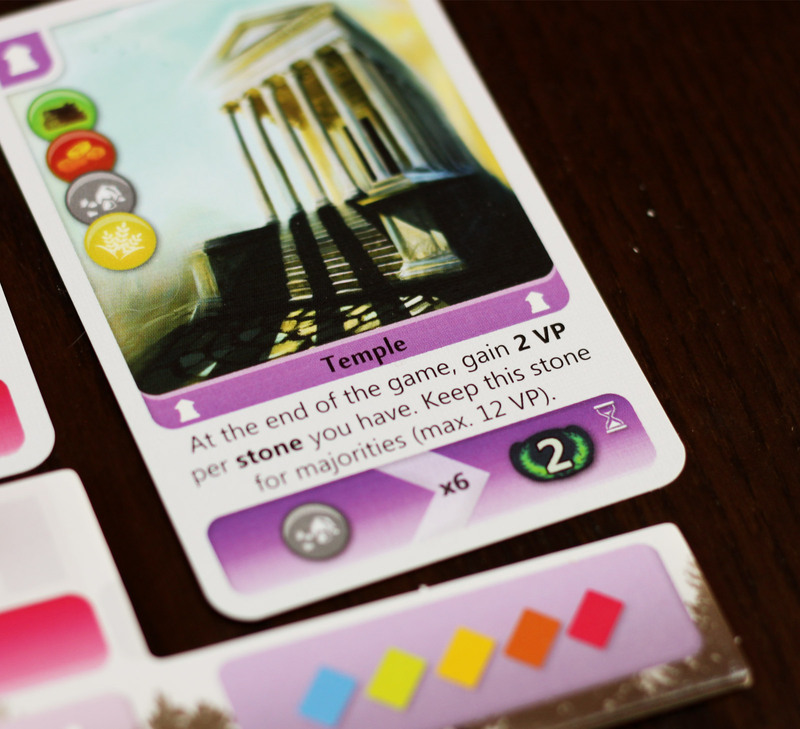 Temples are a special kind of building – there is a limited supply shared among all players, they must be built next to one of your other buildings, they can only be built if you have a full row of the other 5 colors of buildings, and they reward you with many many points at the end of the game. 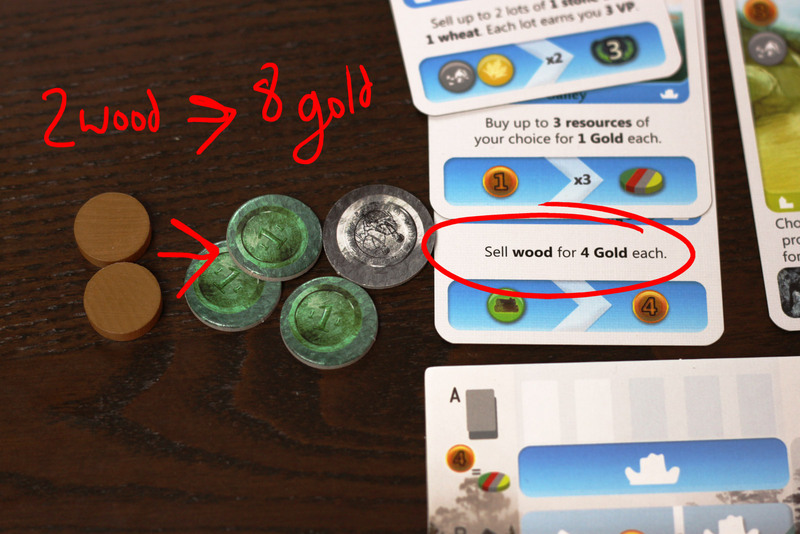 And, you can always trade 4 gold for a resource when you build something. The game ends when either all the barbarian villages are cleared, or all the temples are built. Everyone gets another round of turns and then it is game over. Points are accrued during the game by attacking barbarians and activating buildings that give you points (or let you trade resources for points). At game end, points from Temples are tallied, and player(s) with the most of each type of resource get a few bonus points. Highest point total wins! If you saw Deus in action from a distance, you might be forgiven for thinking it was an epic, thematic civilization building game. After all, it’s got a large (essentially) hex-grid board, a variety of buildings and even military units, and a massive tableau of action cards at each player’s disposal. Of course, when you see the box cover and then read the rules, it’s quite clear that this falls into the Euro family of games. The emphasis here is definitely on unique mechanics and streamlined play, and strictly speaking the theme here is nearly inert. You can’t attack other players, only deprive them of regions they might otherwise claim. (Occasionally you can steal money from them). Okay, each type of building does something related to that type – production buildings tend to give you resources, maritime lets you trade, military lets you attack barbarian villages or take from other players. But that’s really the extent of it. So you might think a grumpy ol’ theme-loving gamer of epic proportions like myself might hiss and throw some garlic at a game like this. C’mon guys and gals, give me some credit. I can recognize a good game when I see it, even if I’m not partial to its flavor. 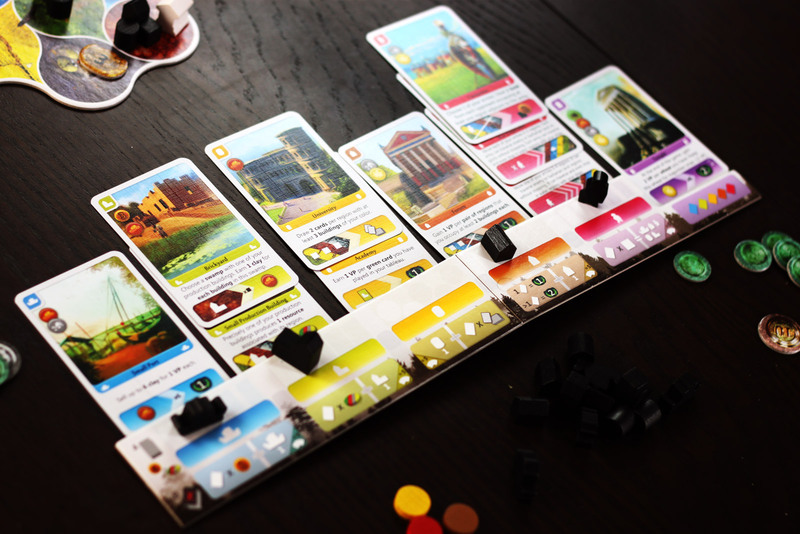 Still, Deus does something nifty that many other euro-games do not; by giving us a board – or rather a small, self-contained world – to build our little euro buildings in, it actually does kinda feel like building a civilization. At least, there’s a cool visual/tactile element of building things up. 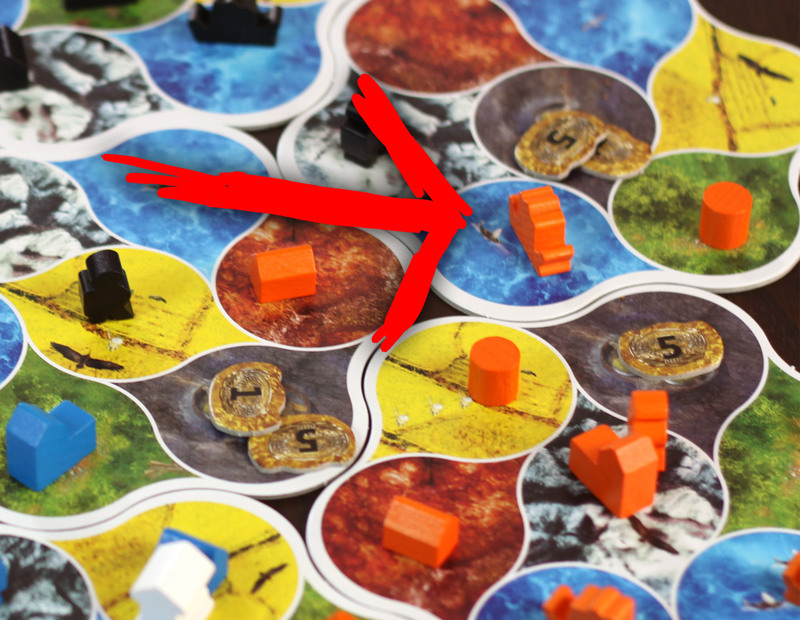 While many euros let you amass a handful of resource cubes and a stack of cards, Deus lets you spread your influence across the land. Or, you can build massive cities crowding into one area. Either way, by the end of the game you can see exactly how your civilization has grown by taking a quick glance at the board. It’s a generally well-designed board too, visually and functionally. The colors are bright and pleasing to the eye, not gaudy, and they’re easily distinguished from each other. I do wish they just went with the hex-grid – that’s what it amounts to practically, with regions sharing up to 6 “sides” but the tear-drop shape with its round edges does not make for flush board sections. Oh well. The other minor annoyance with the design is that while stone (the grey wooden disc) comes from grey regions and wheat (The yellow disc) comes from yellow regions, wood (the brown disc) comes from green regions. This creates a visual disconnect which slows down thinking slightly – there are, after all, more colors of regions than there are resources, and one of those regions is actually colored brown. While it’s true that players can’t occupy that color of region, it’s just weird. Honestly, this is a minor complaint. Deus is a game with truly slick rules. All the fat has been trimmed here. There are almost no “exceptions to the rule” – you just play a card and follow the instructions. The cards provide both a textual description of their ability and a representation of it with icons, creating an easy learning curve while still easy to reference at a glance or from a distance once you learn the icons. As simple as the rules are, there is plenty in this world to explore. A number of paths are provided that lead to victory if you can follow them well enough, and you have to play with the cards you get. You can’t always rely on a finding any particular card, and if you waste too many turns looking for it you’ll fall behind. 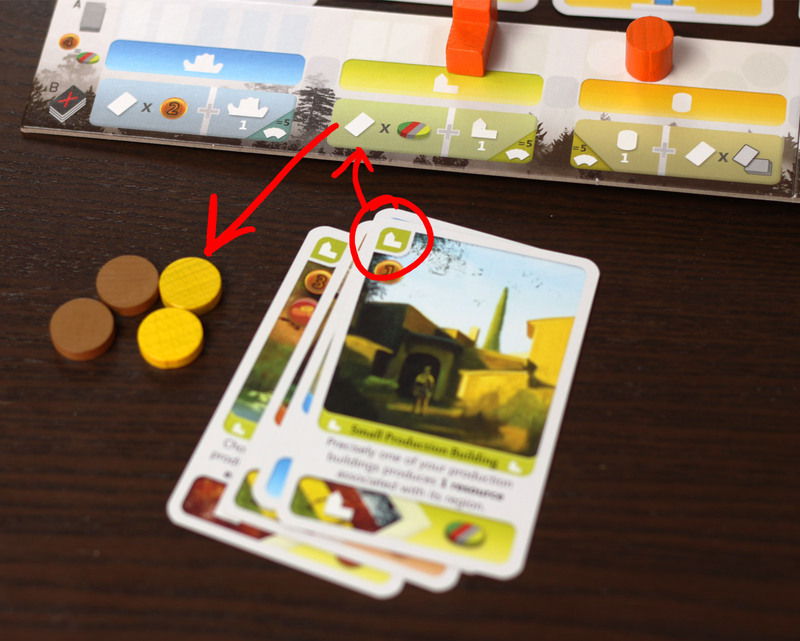 In many euro games, it is wise (or you are simply forced) to build the weaker buildings first, and build upward from there. However, in Deus you may be tempted to build a more powerful card early on, so that it will get activated more than once. This of course requires that you save up the resources for it which will take extra time and effort, so you have to make that choice. You can also choose between spreading your kingdom wide or building up in a few regions; different cards may award you differently based on what you do. Some cards give you points, cards, or resources based on the number of buildings in a region; others award you for having a number of regions with a particular building. You can also decide to build tall – a large number of buildings of the same type, which can activate useful abilities multiple times to great effect – or wide, building all of the building types evenly. The latter allows more access to Temples, which can be a great way to score points at the last minute. It’s a tradeoff between that and activating more buildings, and you’ll probably strike some kind of balance between the two. We may be small, but we’re mighty! The game’s Offering option puts up a useful safety net. It’s an easy way to get to cash or resources you need if you didn’t get a chance to get a building in the right place, or certain resources were taken by other players before you could get to them. Still, you can’t simply rely on Offerings to carry you – you have to balance those turns with building actions, which can score you points more efficiently. Yet in another way, the game is much less forgiving. If you’re not careful, you could play the entire game feeling very productive only to realize you spent all your resources on simply building more buildings, and never really earned any points. 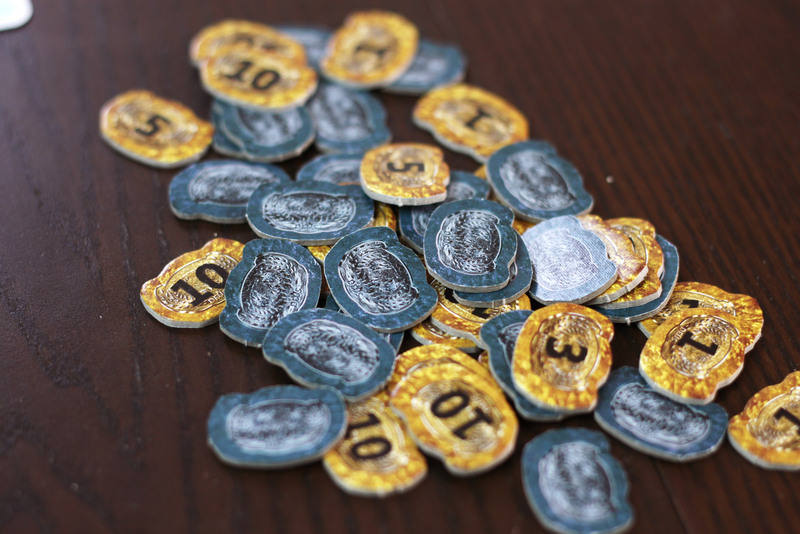 I had a friend get very excited about his massive clay production – in fact, he claimed all the clay resource tokens so that none of the rest of us could use any – but never built anything to convert that clay into anything useful (ie points) and so fell way behind. 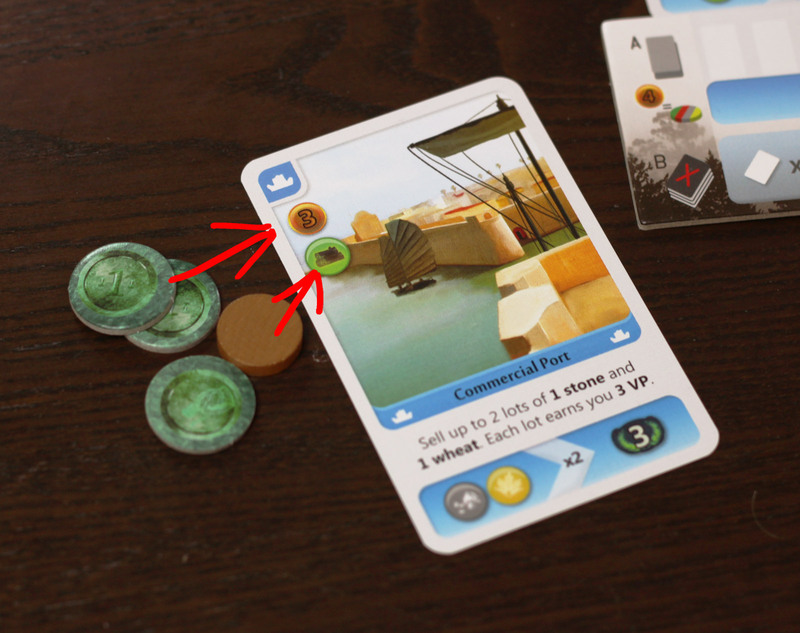 Nothing in the game forces players to earn points in the way that, say, 7 Wonders does. Temples, they give you points. I mean, uh, the favor of the gods. 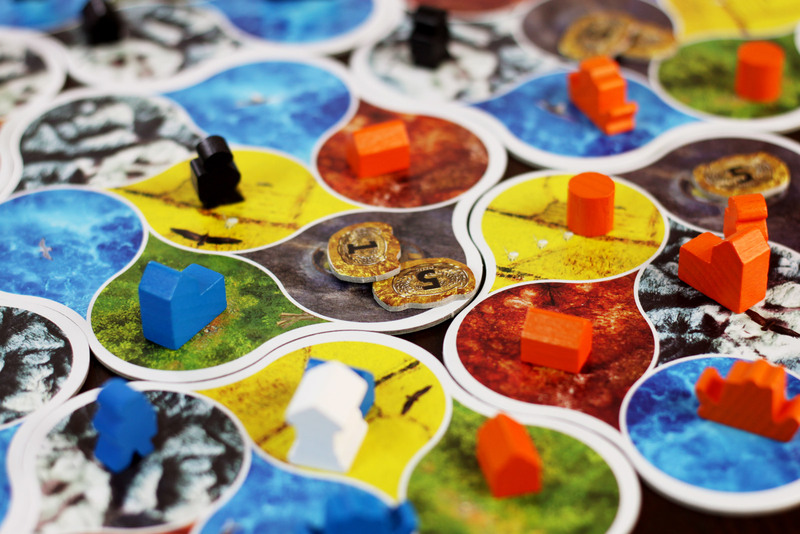 Deus includes a few variant rules at the back of the rulebook, to increase the challenge or provide even more strategic options. These variants include choosing your own supply of buildings at the start of the game, creating alternative shapes for the game board instead of the standard hexagon, and the ability to play a facedown building card as a wild card without a special ability that can still activate the rest of your buildings in a column. 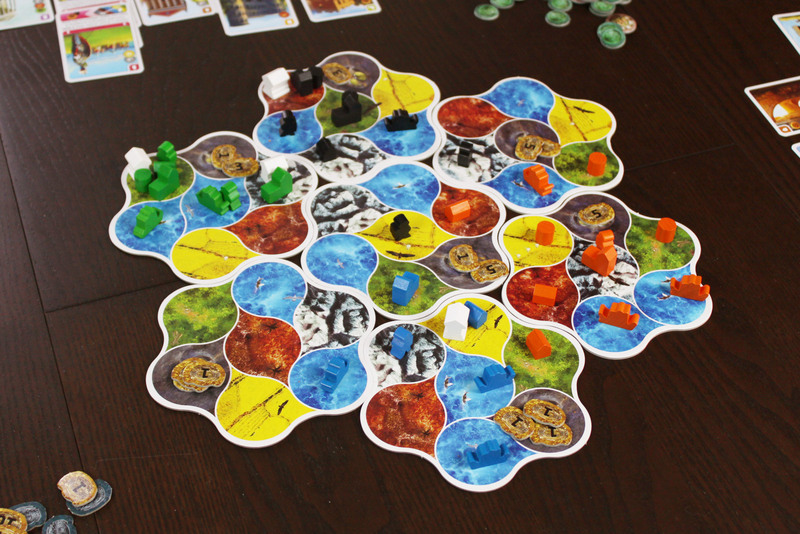 Keeping in mind that I love big, thematic games, Deus doesn’t particularly excite me, but it does have an excellent streamlined system that works very well. 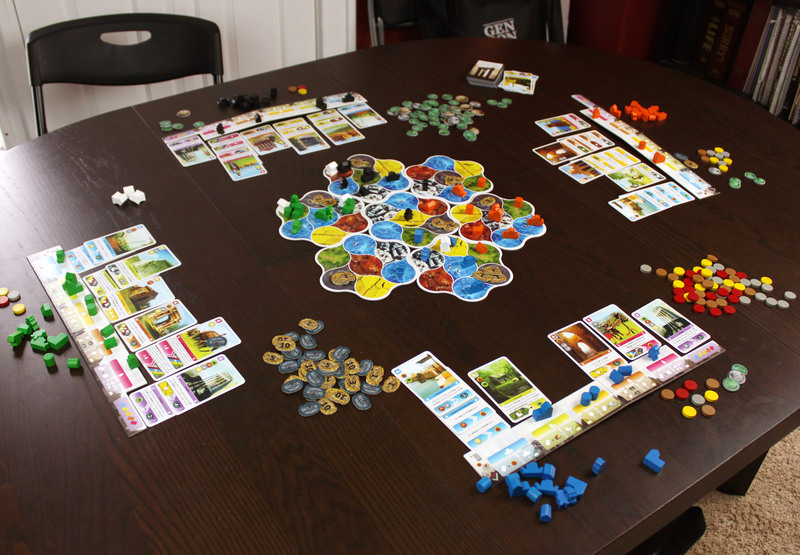 It’s got a lot of room to explore different strategies, and it does provide a feel of expanding and growing a kingdom with the cool-looking board and building tokens. It’s so easy to teach and jump into, and the game moves at a fast clip with little downtime until it ends in a tense climax. I highly recommend you check it out. iSlaytheDragon would like to thank Asmodee for providing a review copy of Deus. Nice review, although Deus is not shorter than Ginkgopolis, in self-proclaimed playtime or in practice. Our first game of Deus took 90m with rules explanation, and even with rules explanation, I’ve never played a game of Ginkgopolis that lasted more than 75m. Really? I thought Ginkgopolis took longer. I guess I shouldn’t make comparisons to games I haven’t played too often. Clearly, Andrew and I have failed. I’ll write a review soon, because it’s awesome. One of the main reasons why I haven’t review Ginkgopolis yet is because I don’t actually own it. Since it’s unfortunately OOP I need to get after buying a copy from someone before it gets impossible to find. On that topic I didn’t find Deus to be reminiscent of Ginkgopolis at all. They are card driven tableau builders with a shared central board but that’s about as much in common as I see. Perhaps I’m missing something? I don’t remember what I said, but I don’t think they’re all that similar either. I think I was comparing them because they share a publisher (Pearl Games). Teaching wise, hands down the easier game is Deus. I dread teaching Ginkgopolis, but I looooooove it. And while I’m here, I’ll share one thought on Deus. I’m usually not an advocate of the term “multiplayer solitaire,” as it’s derogatory in a similar way to Ameritrash (which I try not to use outside of jokes), but if there’s a game that fits the term, it’s Race for the Galaxy. 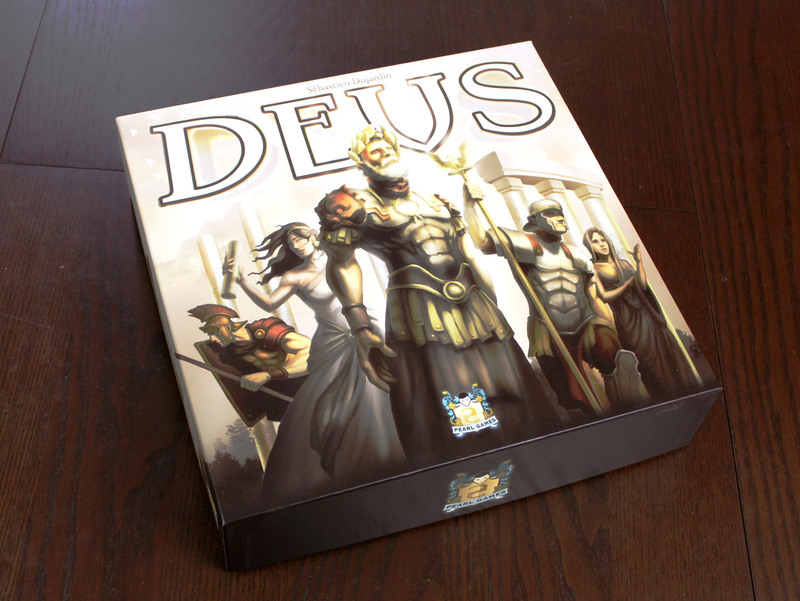 And if there’s a second game that fits the term, it’s Deus. (Actually, I think Deus shares more in common with RftG than just this trait, but I’ll save it.) I usually try to stay fully invested during every game I play, but in my two games of Deus, I was checking texts. Now, part of this was that my wife was at home and trying to work, and I wanted to make sure it was going okay. But part of it is that I wasn’t that invested in what other players did. Even with the soldier cards, there wasn’t much they could do to derail my strategy, and the map was big enough (and building restrictions loose enough) that I didn’t have to worry about butting into them too much. A “check-in” at the start of my turn was enough. That being said, I LOVE Deus, and I’m not bothered by the “multiplayer solitaire” in the game. But I think this game, despite the shared map, deserves the descriptor more than many other games that get labeled as such. Great review! Is this an engine-building game? Definitely. It’s unique, however, in that each building can be activated a maximum of five times,* so players are rewarded for building the pieces of their engines in order. I realize this article is from over a year ago, I just wanted to say: it makes perfect sense that wood comes from green regions. Wood comes from forests, which when viewed from above are green. It’s true that forests are green; usable lumber is brown. But from a usability standpoint, this could have been streamlined. (For example, green discs would have worked well as wood.) There’s an extra mental conversion that has to happen to link the green region and brown resource, and this was avoidable.